Every company does the same things...differently. webOSCAR 2.0™ automates and streamlines the process of managing employee- and company-specific health, safety and environmental data and requirements in a single, real-time system. Find out how your organization can help your customers to efficiently manage their essential business process of health and safety—for all their employees, and for their company. Companies and organizations in industries of all sizes, with single or multiple facilities around the world, rely on webOSCAR every day to effectively protect their employees’ health and keep on top of compliance requirements. Efficiently managing safety and health, reducing risk and increasing employee productivity is every company’s goal... but each of your customers already has its own process and methods! Provide your customers with the RIGHT TOOL to help them accomplish this important goal - easier, faster, and more effectively. Designed and developed by one of the United States’ leading occupational medicine physicians with 25+ years’ practice and consultation experience, webOSCAR 2.0 solves an important customer problem for companies of all sizes and industries AND complements, supports and enhances the value of the services and/or products your organization already provides to your customers. This configurable, software-as-a-service business information platform handles it all in one place - employees’ and company compliance requirements and compliance activities, trainings, injuries & incidents, drug tests, PPE, and more. It replaces your customers’ inefficient information “silos” caused by using multiple, disparate software applications, homemade spreadsheets and other desktop applications, and manual methods of data management. Automates all employees’ specific compliance assignments, schedules, results and interpretations of trainings, medical surveillance exams, biological monitoring, respirator medical clearance exams and fit tests, audiograms, injuries, drug tests, PPE, incidents, industrial hygiene and more. Simple to use. Almost anybody can quickly learn and use webOSCAR with minimal training or professional qualifications—reducing the need for or dependency on in-house expertise or consultants. Streamlines actionable data through real-time dashboards, robust analytics, email delivery and document management tools. Quickly and easily manage employees' activities, results, and documents, all in one secure place. webOSCAR frees up time for more direct engagement in the daily operations of your business. Eliminate errors, oversights, omissions, or late or missed compliance activities. webOSCAR prevents expensive, disruptive citations, penalties, and operational problems. 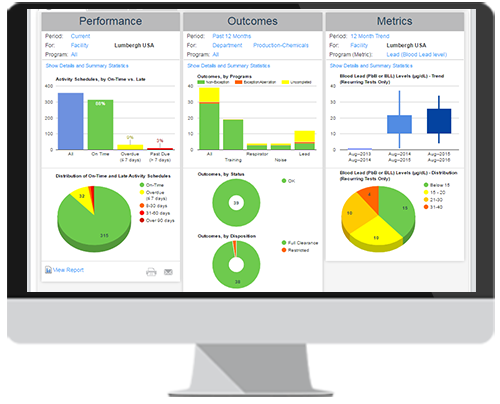 Automatically aggregate and statistically analyze results, outcomes and performance. 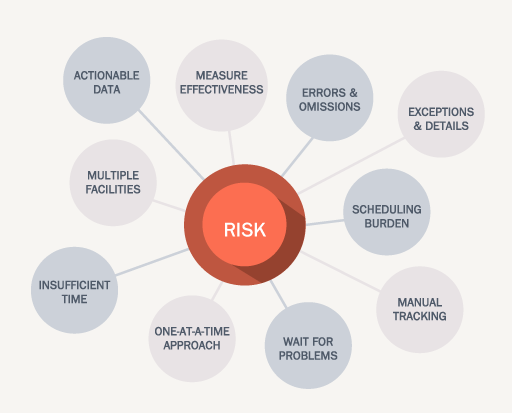 webOSCAR objectively measures compliance effectiveness and justifies investments that make operations safer. Branded with your organization’s name, this platform is either integrated into your existing customer portal, or accessed by your customers as a stand-alone technology solution—creating a continuous, 24/7 partnership. Generates significant, additional passive revenue. Leverage web-based technology and expertise for retaining existing customers and attracting new customers—without incurring development costs and overhead to support it. Affordably priced. The platform can either be bundled into the pricing of your existing services, or can be offered at a low per-employee-per-year price that does not require a significant budgetary allocation for customers—and quickly pays for itself through savings. Scalable and simple-to-use. Customers’ accounts are configured and your organization manages customers through your own, dedicated administrative portal, with little or no information technology (IT) support required by your organization. Integration stack capability to share data on a real-time basis with applications such as HR, ERP, instruments, laboratories, and safety/health equipment testing software operated internally or externally provided by vendors (including your organization). Aggregates and analyzes all your customers’ data to forecast your services, and improve or develop new services or products. Hover your mouse over any Risk factor to see a description. When it comes to safety and health, employees are literally “moving targets.” Effectively managing health, safety and environmental risk is a data-intensive, dynamic, and complex process that requires much more than fulfilling minimum regulations and recordkeeping. Our Solution is Your Solution! webOSCAR is a single, configurable, real-time system that automatically schedules, tracks, collects and organizes compliance activities, data, documents and tasks; and analyzes, reports, and distributes individual and aggregate results, outcomes and performance. Incorporates and embeds subject matter expertise designed by top experts in occupational health and safety, industrial hygiene and OSHA enforcement. A configurable, easy-to-use automated alternative to time-consuming, error-prone desktop software tools like Outlook, Excel, and Access—or manual paper files, folders, post-it notes, and checklists. webOSCAR optimizes the compliance workflow by automating repetitive tasks, and by providing built-in, configurable expert rules and decision support to efficiently and correctly manage H&S as a business process. Information is current, consistent, correct, and complete. Information is available when, where, and how it is needed. Information is quickly, easily, and securely recorded, uploaded, viewed, and outputted. Information is managed according to the rules and logic specific to the business processes. 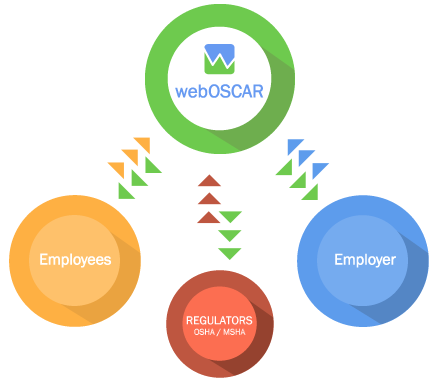 The webOSCAR technology platform was developed by an Occupational Medicine physician with over 25 years’ experience providing medical and compliance consultation services to highly regulated, hazardous industries. His insight into the challenges and complexities these industries face in achieving effective compliance, and the importance of this process to protecting their employees’ health, was his impetus for starting Verdi Technology and creating webOSCAR. Copyright © 2011- Verdi Technology, Inc.